The FASS Fuel Pressure Regulator is for use on Dodge, GM, and Ford 7.3L applications. Engineered from quality 6061 T-6 billet aluminum stock and features full adjustability from 0 to 100 PSI in the FASS diesel fuel system. Contains a 1/8″ MPT boost compression port which grants better fuel pressure regulation from idle to full throttle. 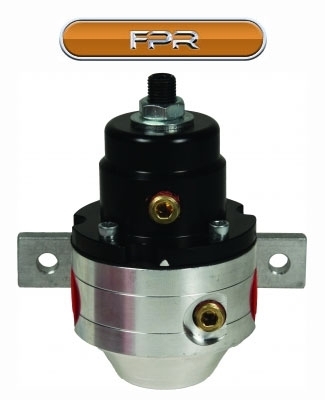 This fuel pressure regulator is constructed with 1/2 inch MPT inlet and outlet ports. Some of the benefits of installing a FASS Fuel Pressure Regulator are the ability to fully adjust the fuel pressure in your FASS system, above or below what it was initially designed for. This product has a boost compensation port that allows boost pressure from the turbo to be directed to the FPR-1001 which momentarily increases the pressure the FASS system produces. When installed with the boost compensation connection this system will allow the fuel pressure and PSI to stay consistent when at open throttle without a drop off in pressure. The FASS Fuel Pressure Regulator is covered by the manufacturers four year warranty after you fill out and return the warranty card. This the only fuel pressure regulator to be covered by this type of warranty! A fuel pressure regulator is a device designed to uphold a consistent fuel pressure for correct fuel atomization. More fuel is going to the fuel rail that needs to go there, so a regulator preserves a certain amount of fuel pressure in the rail then returns whatever else is left to the tank. Inside the regulator casing is a spring that pushes against a diaphram. The fuel pump has to generate enough fuel and enough pressure to overcome the spring pressure. The left over fuel is then sent back to the tank through the fuel line return line. When your truck is at idle, there is less pressure against the fuel coming inside the regulator because it has a vacuum hose attached to it inside the intake manifold. When you apply gas and the vacuum drops in pressure, the fuel pressure increases to let the engine access more fuel when needed. What signs will there be when my fuel regulator is failing? Lack of fuel pressure or excessive fuel pressure are a big tip off. There may also be black smoke or an instant drop of fuel pressure once when your truck is turned off. Give us a call at 714-848-2170 M-F from 8-5 PST – We will answer your questions regarding the FASS Fuel Pressure Regulator. Ask about Free Shipping! Live locally? We install the FASS Fuel Pressure Regulator! Feel free to stop by our location and meet us! OC DIESEL, INC. is located at 17242 Gothard Street, Huntington Beach, CA 92647 Suites A and B. We have a full service shop staffed with knowledgeable technicians who are ready to squash any Diesel Repair issues. Torco ATF 100% Synthetic Automatic Transmission Fluid is specially engineered for sever operating conditions associated with racing, highway and off highway use. This new HiV Fluid was originated using 100 percent synthetic base oils and additive technologies made to administer to extreme loads, high operating temps and high speed situations. This is a multi-functional fluid for automatic and power shift transmissions allowing for top-quality shear resistance, tremendous gear protection and clean operation for extended component reliability and clutch performance. All of these things will equate to lower operating temperatures. 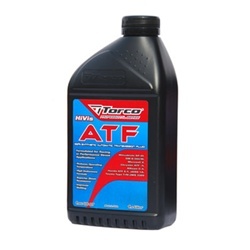 Torco ATF 100% Synthetic Automatic Transmission Fluid is recommended for use on automatic and manual transmissions for a wide array of automotive manufacturers including Audi, BMW, Chrysler, Daewoo, Ford, General Motor, Honda, Hyundai, Isuzu, Jaguar, Kia, Land Rover, Mazda, Mercedes Benz, Mercury, Mitsubishi, Nissan, Porsche, Saab, Subaru, Suzuki, Toyota, Volkswagen, Volvo, and many more! 100 percent synthetic transmission fluid will provide an incredibly long life for your transmission. It can provide this by controlling and lessening fluid breakdown caused by high temperatures and will provide control of deposits that after time can lead to sluggish engine operation and shifting. Torco ATF 100% Synthetic Automatic Transmission Fluid maximizes power throughout your engine and reduces gear box temps. It also provides an excellent level of shock load, EP and wear protection. Give us a call at 714-848-2170 M-F from 8-5 PST – We will answer your questions regarding the Torco ATF 100% Synthetic Automatic Transmission Fluid. Ask about Free Shipping! The TS Performance PowerFool2 NOS System was engineered exclusively for diesel applications. All wiring and solenoids are self contained in two boxes and are armed with all the hardware and fittings you will need for installation. The PowerFool2 NOS System takes the mystery of of Nitrous and eliminates the complications of wiring. Installation location is entirely up to you. This system gives you lots of control and choices like where you want to place your nozzles and how much nitrous you want to apply. This application works even if you haven’t yet O-ringed your heads. If you have reservations about using nitrous, this is the perfect product for you. You can enjoy the added power without having to figure out mixtures or deal with the stress that comes along with setting up a nitrous system. The TS PowerFool2 system can get you up to 300 hp and should be used in compliance with your application. How does a NOS System work? When nitrous oxide is heated to around 570 degrees, it separates into oxygen and nitrogen. Injecting nitrous oxide into the engine provides for far more oxygen accessible during combustion. Since you already have the oxygen, you can also inject more fuel, permitting the same engine to achieve more power. A NOS system is the easiest way to achieve a striking amount of boost to an engine. Is nitrous oxide safe in a diesel engine? Yes! Diesel engines are the only application that nitrous actually makes it safer to operate. Nitrous give more oxygen to a diesel engine. This works to burn more fuel somewhat like a turbo. The intensely cold nitrous offers a large amount of intercooling. The worst thing that can happen if too much nitrous is introduced to the engine is it cools the intake too much to where you lose fire and you simply have to restart your engine. The larger your engine is, the more nitrous it can handle. As stated earlier gains of up to 300 hp can be achieved but in smaller engines 150hp can be reached safely. Torque is also greatly affected. Gains of up to 1600ft. lbs. can be realized. Give us a call at 714-848-2170 M-F from 8-5 PST – We will answer your questions regarding the TS Performance PowerFool2 NOS System. Ask about Free Shipping! Live locally? We install the TS Performance PowerFool2 NOS System! Feel free to stop by our location and meet us! OC DIESEL, INC. is located at 17242 Gothard Street, Huntington Beach, CA 92647 Suites A and B. We have a full service shop staffed with knowledgeable technicians who are ready to squash any Diesel Repair issues. The Recon Winch has all you are looking for if you are an enthusiast in mudding, off-roading, rock climbing,or salvage and recovery. 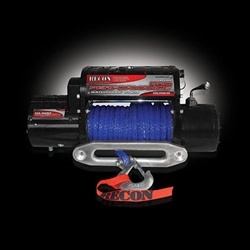 Recons top of the line winches offer you the highest quality in line speed and unparalleled pulling power. With a lightening quick 28 feet per minute line speed and a pulling capacity of 117,500 pounds, you will never be left stranded out on the trail. The Recon Winch features automatic in-the-drum brakes and a sliding ring gear clutch. The gear ratio of the Recon Winch is set at 358.4:1 for an increase in torque and a 7.0hp series wound motor. The cable line is constructed of aircraft grade steel and measures out to 1/16″ diameter by 92ft. length. The Recon Winch is covered by a lifetime warranty. How does a winch work? The winch is powered by the vehicles battery. The motor gives power to the gear mechanism that turns the winch drum and winds the steel wire rope. The winch drum is the cylinder that the rope feeds onto. It is driven by the motor and drive train. The reduction gear transforms the winch motor power into a massive pulling force. The brake is automatically applied to the winch drum when the motor stops and there is a load on the rope. The brake prevents the winch from letting out line and this holds the vehicle in place. The clutch then lets the user manually unfasten the spooling drum from the gear train letting the drum spool freely. Operating the clutch bolts the winch drum back onto the gear train. Another feature of the Recon Winch is the control box. The control box gets its power from your trucks battery. Solenoids convert power to the motor, letting the user change direction of the winch drum rotation. The remote control plugs into the winch control box. This enables an operator to control the winch direction not to mention gives you the ability to operate the winch at a safe distance. Give us a call at 714-848-2170 M-F from 8-5 PST – We will answer your questions regarding the Recon Winch. Ask about Free Shipping! 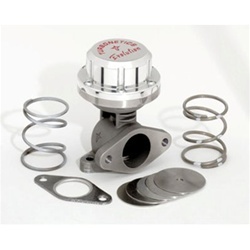 The Turbonetics Evolution Wastegate is the leader in externally mounted boost control! The Evolution has a cast 304 stainless constructed body, nitronic 60 stainless steel one-piece valve, rolling type diaphram and a polished aluminum cap. The body of the wastegate is designed with a computer flow analysis ensuring the most efficient engineering. Its compact design is tailored to fit into the smallest of turbo systems. Its floating valve seat can stand up to 400+hp and outflows other systems up to 20 percent. In 2009 Turbonetics added an adjustable screw in the cap which now comes standard with each kit. How does a wastegate work? A pressure actuator is regulated by boost pressure and establishes whether the wastegate is open or closed. When the wastegate is closed, it is in its latent position. As the boost pressure raises, force is employed to the actuator. when the boost pressure surpasses the spring value, the actuator will gradually open the wastegate, sidestepping some of the gases from the exhaust allowing it to keep the boost pressure at a set level. In simple terms, a wastegate prevents the boost pressure from climbing for an indefinite period and as a result killing the engine. Why do I need an aftermarket wastegate? Most factory turbo systems have a built in wastegate intended for use with stock boost levels. Installing an aftermarket external wastegate is designed for if you want to install an upgraded turbo or for better control of boost levels and power from your engine. Furthermore, most tuners will suggest an external wastegate for an engine putting out 400hp or more. If you try to use a factory wastegate to support a high horsepower engine, the actuator spring will be conquered and limit your boost levels. An aftermarket wastegate has larger ports, higher pressure springs and a larger diaphragms to control high boost pressure. An additional manufacturer of Wastegate actuators is Banks Power. They offer actuators for Ford, Dodge and GM. We offer a wide selection of Wastegate Actuator products for most diesel truck, motorhome, and RV owners. Enjoy better fuel economy and engine performance with our selection of Wastegate Actuators. Whatever your activities or applications, adding a Wastegate Actuator can help improve overall performance. We also carry many replacement parts, accessories and components. Give us a call at 714-848-2170 M-F from 8-5 PST – We will answer your questions regarding the Turbonetics Evolution Wastegate. Ask about Free Shipping! Live locally? We install the Turbonetics Evolution Wastegate! Feel free to stop by our location and meet us! What is a steering spindle/knuckle? In a suspension system a steering knuckle holds the bearings and connects the steering and suspension to the rotating components. The steering knuckle is sometimes also called an upright or hub. The tire assembly and wheel connect to the hub or spindle of the knuckle where the wheel spins while maintaining a steady range of motion by the knuckle or suspension assembly. The spindle is a part of the suspension system that carries the hub for the wheel and attaches to the upper and lower control arms. The purpose of the steering system on your truck is to convert rotary movement of the steering wheel into angular movement of the front wheels. The axle supports the front wheels by aid of linkage and the steering box. The front wheels are connected to the steering wheel so they can can spin without the danger of a lateral slip. The steering system also helps in part to cushion road shocks. Looking to upgrade your steering system? Take a look at the Cognito Heavy Duty Tierod Kit w/ Spindle/Knuckle. This system is for use on the 2001-2010 6.6L GM Duramax and is intended to replace the factory tie rod assemblies from the ends of the drag link to the spindles. It was engineered to get rid of the factory outer tie rod and the inner ball and socket joint. These components are exchanged with semi joint rod end units. The Cognito Heavy Duty Tie Rod Kit uses right and left hand threads as well as a straight adjuster tube to refine toe settings. These kits are made from 1 inch diameter DOM steel tubing for ultimate strength and durability. These are meant to replace the factory adjusters that neck down at the threads. Factory adjusters are well known for bending where the threads connect to the outer tie rod. The Cognito system replaces the inferior inner ball and socket found in factory systems. Cognito use rod ends that have a 3/4 inch shank and body with a 5/8 inch hole for the mounting points. Cognito line the rod ends with Teflon enabling them to lubricated themselves! The tie rod is part of the steering apparatus in a vehicle. It is a structural rod used as a tie and capable of carrying tensile loads only. Tie rods consist of an outer and inner end. They spread force from the steering center link to the steering knuckle. This causes the wheel to turn. The outer tie rod end connects with an adjustable sleeve which is used to set a vehicles alignment angle. A worn tire rod can lead to unreliable steering and major tire wear or damage. What other components of my steering system would I want to upgrade? Another important component to your steering system and worth upgrading is the Center link. A center link can aid in stopping the large amount of play you may be noticing in your steering. Center links have been known to fail after some time. Upgrading to a stronger and more dependable than stock part will eliminate this concern. One method of determining if your center link is not working correctly is to hold onto it and see if it is wobbling. Make sure to check for cracking or excessive wear. OC DIESEL suggests the PPE Center Link with Puller made for the 2001-2010 6.6L GM Duramax. It is constructed of 304 stainless steel, come with a one year warranty, and will greatly aid with strengthening your steering system. While you’re at it, OC DIESEL also recommends upgrading the steering mechanism on your truck with the PPE Pitman Idler Arm Support Kit. This kit is made for the 2001-2010 6.6L GM Duramax 2WD & 4WD 2500HD & 3500. The addition of an upgraded Idler Arm product can increase strength and durability by replacing weak, breakable stock parts which can prevent costly repairs. This is a must for lifted trucks, bigger tires, drag racing, and off -roading. The Pitman arm is a linkage attached to the steering gear that changes the angular motion of the sector shaft in the linear motion necessary for steering the wheels. The Pitman Arm is held by the sector shaft and supports the center link with a ball joint. It transfers the motion it receives from the steering box into the center link, making it move from left to right to turn the wheels in the right direction. The Idler Arm is connected between the opposite side of the center link from the Pitman arm and the trucks frame to hold the center link at the correct height. Give us a call at 714-848-2170 M-F from 8-5 PST – We will answer your questions regarding Steering Systems. Ask about Free Shipping! Live locally? We install the Cognito Heavy Duty Tie Rod Kit w/ Spindle/Knuckle! Feel free to stop by our location and meet us! OC DIESEL, INC. is located at 17242 Gothard Street, Huntington Beach, CA 92647 Suites A and B. We have a full service shop staffed with knowledgeable technicians who are ready to squash any Diesel Repair issues. The Airaid PowerAid Throttle Body Spacer was engineered to enrich your vehicles off idle to midrange performance and productivity. This throttle body spacer has a unique helix bore design that produces a spinning action of the air coming in. As the air passes through the throttle body, it forces the air molecules to uphold a high speed. This is a benefit because it delivers an atomized mixture of air and fuel on its way to the combustion chamber. Benefits are huge torque gains of 800 to 2500ft. lbs. This could also equal fair gains in fuel economy. The Airaid PowerAid Throttle Body Spacer was engineered from the best quality aircraft grade billet 6061-T6 aluminum and designed precisely for your application. These spacers can be installed using normal hand tools. There is no drilling or cutting required for installation and includes a lifetime guarantee! A throttle body spacer adds rapidity of air flow by improving the vacuum response to the TBI. It also creates an airflow vortex. This increases the runner length of the intake manifold while at the same time increasing the over plenum volume and atomization. This stops the air-fuel mixture from smacking the bottom of the intake manifold and springing back up to disperse in the intake manifold providing more throttle response and overall better performance. Throttle body spacers can also affect horsepower up to 18hp. Want more torque? Throttle body spacers can get you up to 25ft. lbs. of torque! Velocity in the combustion chamber makes for more torque by speeding up air flow, the more air flow-the more torque. Spacers offer more height for the air-fuel mixture to have a more measured flow into the intake ports of the manifold increasing torque response. Gains in fuel economy is an added benefit of throttle body spacers. You can expect 3-4 mpg increases after installation. Give us a call at 714-848-2170 M-F from 8-5 PST – We will answer your questions regarding the Airaid PowerAid Throttle Body Spacer. Ask about Free Shipping! Live locally? We install throttle body spacers! Feel free to stop by our location and meet us! OC DIESEL, INC. is located at 17242 Gothard Street, Huntington Beach, CA 92647 Suites A and B. We have a full service shop staffed with knowledgeable technicians who are ready to squash any Diesel Repair issues.